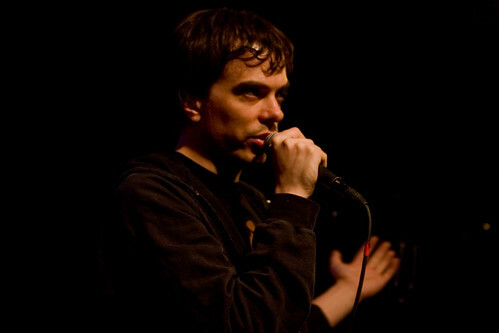 Darcy James Argue, originally uploaded by Lindsay Beyerstein. Sincerest thanks to all who came out to hear us Sunday night. I'm afraid the recording karma was unkind -- my own digital device failed to cooperate (not for the first time), and we are still waiting to see if the BPC's house recording turned out. But in the meanwhile, please feel free to check out our Live Audio Archive and also these very kind writeups from Karen Hildebrand and the indefatigable Terri. Lindsay and Peter have photos. Also, I make a cameo appearance at Hooves on the Turf's "Where were you when Obama won?" roundup. Ours was not the only bigband at the BPC Sunday night. We were preceded by bassist Marty Isenberg's assemblage. I hadn't heard of his group before and only managed to catch their closing number but they were very hip -- check 'em out on MySpace. Also, anyone catch the name of the badass neo-soul band that went on after us? They were phenomenal.